Diana Macarena Croce, who was First Runner-Up at Miss Venezuela 2016 and represented Venezuela at Miss World 2016, was appointed to represent Venezuela at Miss International 2017 in Tokyo, Japan. 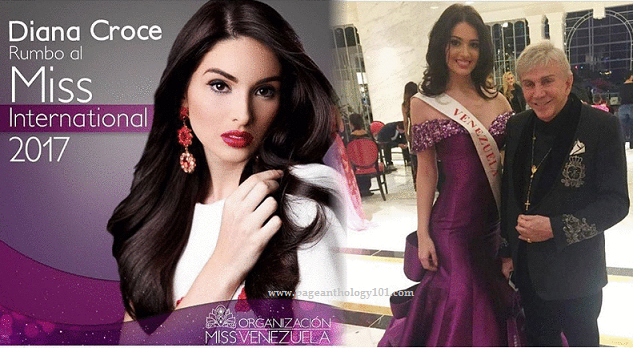 According to reports, Rosangelica Picitelli, the first beauty to be appointed to represent Venezuela at Miss International 2017, could not compete in Japan due to some family issues. But rumor says that Miss International committee only accept any of the Top 3 finalists of the national competitions, disqualifying Picitelli to compete since she was fourth runner-up at last year's Miss Venezuela pageant. 20-year-old 5'9" tall stunner Croce was appointed to compete at Miss World 2016 in Washington D.C., USA by Miss Venezuela CEO Osmel Sousa after Miss Venezuela Mundo pageant was not held because of economic recession. Miss International 2017, which will be 57th edition of the pageant is slated to take place on November 14, 2017.